My name is Svetlana Levchenko. I'm living in Moscow Russia. Jem-Dandy is a small cattery, which was registered in CFA system in 2005 (reg. # 211082). But I'm dealing with cats since 1996. Persian and Exotic Cats are my love. I gave my preference to bi-color. My cats are constantly surrounded by concern and live together with me and my family. All my kittens are brought up with the great love, because I love greatly these remarkable animals. My purpose is the producing healthy kittens with the sweet open expressions and the excellent character! The blood-lines of the best and well-known catteries are represented in pedegrees of my cats: Seder Rennes, Davikatz, Ocalicos, Brannaway, Rhamjoge, Catillak, Parti Wai, Candirand, Ginoba, Maradan, Starbabies, BabyBest, El Zaburs, Wishastar, Tombrok, Pajean, Budmar, Fabuls, Zhao, Harwood, Blueskyeyes, Couronne, Steeplcheas, Artemis, Scrimshaw, Boberan, Latin Lover, D’Eden Lover, Lisa-Light, Meihua and others. If you need any information about my kittens, plz write on my e-mail. I will be very glad if you tell me about yourself and your cattery. I hope you will spend a great time on my site. Copyright © 2013. 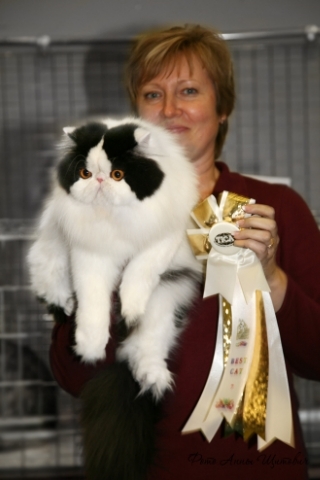 The cattery Persian and Exotic cats "Jem Dandy"